“It’s when you can’t hear the bats, that’s when the bats are coming.” Words on the cover of a birthday card sent by a friend. 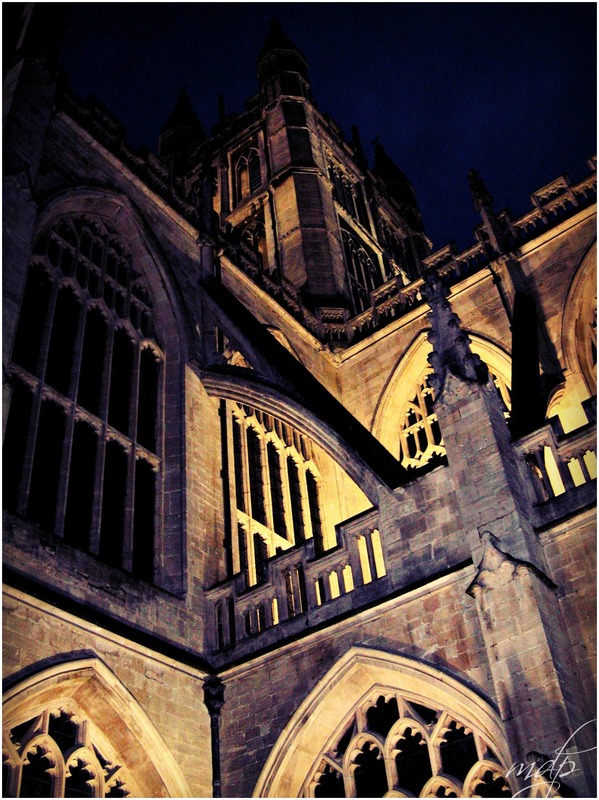 Bath Abbey church is a fine example of Perpendicular Gothic architecture. That is what Wikipedia says. I marvel at the magnificent engineering and building of it. And afterwards — all those peasants willed to cast their eyes heavenward to imagine the grandeur of God, while forgetting how poor and, probably, how hungry they were. I shot this photo nine years ago on a trip to Bath, England. My husband, son, and I were doing the nighttime Bizarre Bath Comedy Tour through downtown Bath. We stopped by the Cathedral while our guide performed a magic trick. Looking up, I imagined those shadowy flying buttresses as stony arms that were daring me to turn my back to them. At which point, they’d release the bats.